Exposure Time: 2 minutes 26 seconds. I got in my car this morning to go to the gym and She Sells Sanctuary was playing on the radio. Oh, how it made my heart happy to hear this song! It was my favorite song when I was a young adult. And even today, I love everything about it. And I think it is a good theme song for me because, damn. I feel really dragged down by the world lately. Here’s a photo for photography Friday. 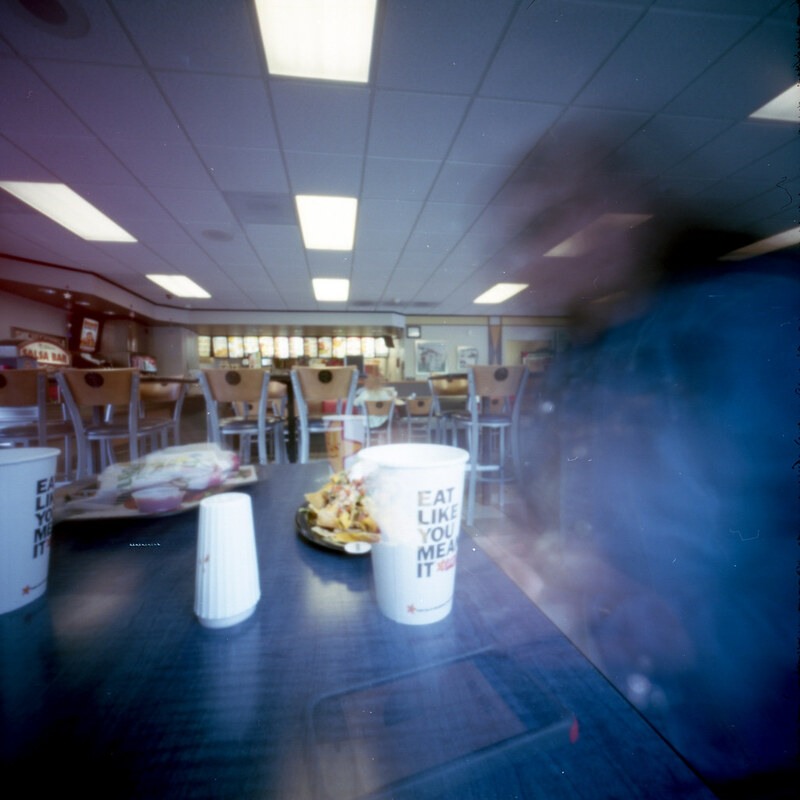 It’s a pinhole self portrait made with my zero 2000 while eating lunch about a month ago. Happy Friday! I am confusing myself. I have two “one such and such a day” projects going on two different blogs and I kind of forgot which photography project I was posting on this one. I think I will post something from my One Pinhole A Day project. Here is a pinhole photo from the day after the election. I was actually sick that day, and not because of the results. I decided to pinhole myself taking a nap. while I was napping a friend texted me to cheer me up. My first roll through my Ondu also featured a couple of selfies! Here they are. This afternoon I will be driving up to the Seattle area for the opening of Slowing The Selfie , a photography show of pinhole self portraits by PNW pinhole photographers. Three of my photos will be in that show. I am very, very honored to be a part of it. Also looking forward to hanging out with some good friends. The show is at VALA Eastside in Redmond, WA and the opening is tonight from 6-8 pm. Do stop by if you are in the area!! More info can be found on their website. This is not one of the photos in the show. This is a self portrait from my “Sheet A Day” project (in which I shot one sheet of 4×5 film a day in my Zero 45). I’ve been struggling with jet lag the past few days and this was me, basically, at 8:00 pm last night. I passed out hard.